In many ways, “Kong” feels like a remix of pulpy-action cinema. There are splashes of “Indiana Jones,” echoes of “The Mummy” and scenes reminiscent of “Apocalypse Now” or “Jurassic Park.” From the blaring ‘70s hit songs to Henry Jackman’s orchestral-rock score, the movie oozes nostalgia from start to finish. At times, it’s almost like a mishmash of older films with better effects. But that’s not necessarily a bad thing. “Kong” has a lot of fun with its source material and plays around with various monster-movie tropes. It succeeds in exemplifying crowd-pleasing moments like sudden jump-scares but also ends up subverting a few cliches to great effect. Regrettably, the story itself is paper-thin: A dubious setup is used to get a group of soldiers and scientists onto Skull Island, a legendary archipelago surrounded by a perpetual storm. Character motives are two-dimensional or nonexistent, although a bit of leeway is given here since “Kong” does deal with a large ensemble cast with little to no time to delve into each character. British tracker Conrad (Tom Hiddleston) and Lieutenant Colonel Packard (Samuel L. Jackson) lead the vast expedition, but neither role goes much beyond stereotypical action-movie badass. Conrad has his moments of empathy and heroism, which even out his largely stoic personality. Packard is the embodiment of cool and can somehow stare down an enraged Kong while things are exploding around him — you know, typical action-movie stuff. John C. Reilly plays stranded pilot Hank Marlow, deserving a mention mainly for the comic relief he brings and the katana he wields. Very, very satisfyingly, the katana is put to good use. “Kong” finally hits its stride once the crew approaches Skull Island. From there on out it is pure, primal pandemonium. The film excels most when reveling in its chaos with its visceral action beats painted in surreal, graphic novel-esque cinematography. Clever framing, dazzling vistas and creative set-pieces underscore the blood-pumping action, making each scene a kinetic, visual feast. The king himself is lovingly portrayed, resplendent in both rage and grandeur. Lingering shots of Kong looming over mountains and silhouetted against the sun are equal parts majestic and terrifying. His mind-boggling physical feats also answer the nagging question of how the ape king will fare in his inevitable clash against the larger Godzilla. No laser beams, but rest assured this Kong can throw down. Unfortunately, it’s not fun and havoc all the way through: There are a few bumps in the rollercoaster pacing that serve as the film’s greatest strength. Expository dialogue and tie-ins to the planned monster cinematic universe feel a bit artificial at times, and certain predictable plot points hamper the tension. But, hey, it’s a King Kong movie. No one is going to watch “Skull Island” for mastercraft storytelling, tour de force acting or to think deep thoughts. They will watch it for the legitimately insane monster fights. They will go for the escapism, the thrill and a giant gorilla taking down attack helicopters with his bare hands. 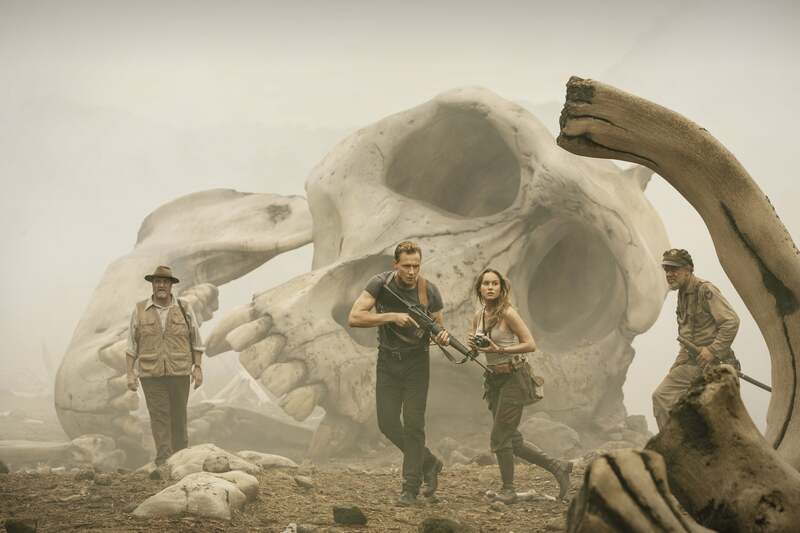 For what “Skull Island” promises, it delivers. And in the realm of monster movies, “Kong” is king.